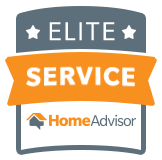 Are you tired of geese and all the problems that are caused by their living in and near your property. Well Alternative Earthcare has a solution. First a little explanation of why geese behave the way they do and then our solution to the safe removal of them from your property. The annual life cycle for geese begins in late winter when adult pairs return to nesting areas in late February or March depending on weather conditions. Egg laying and incubation generally extend through April or May. During this time period geese will aggressively defend their nests and will attack if approached. After nesting geese undergo an annual molt, a 4-week period where they cannot fly because they shed and re grow their outer wings feathers. Molting occurs between mid June and late July and resume flight in August. During the molt is when congregate at lakes or ponds to rest and feed, this is also another time period become very aggressive. Canada geese have a tendency to return where they were born and use the same nesting and feeding sites year after year. To manage geese damage to tolerable levels, while conserving the regional goose population and natural environment Alternative Earthcare has developed a Geese Removal Solution. 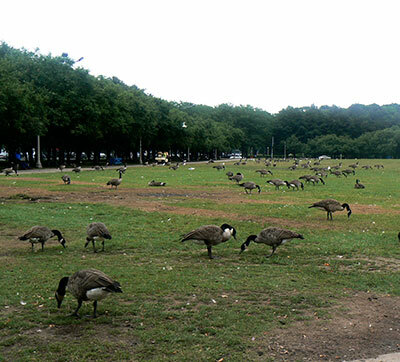 Our Geese Removal Solution is an all natural granular goose repellent that won’t harm animals or the environment. It natually deters the geese from the protected area’s, and helps keep these geese away for up to 25 days. Continued reapplication will train the geese to find other areas to frequent, graze in and nest. Alternative Earthcare Geese Removal Solution provides strong repelling power without harming pets, people or the environment. Use in open areas and other spaces, encroached by geese, near ponds, lakes, and river water edge, golf greens and directly in nesting areas. Take back your property and playing areas for you and your children in both a proper and organic way !!!! 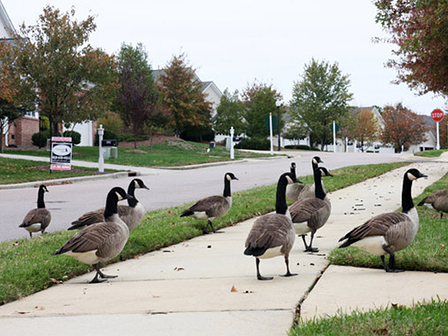 Call us today at 631-499-4300 for a free evaluation of your landscape and how we can rid your property of these pesky and damaging geese.